Thermaltake has been making cases for many years now and they have a wide range of chassis offerings that range from budget mid-tower cases to very expensive full tower designs. Today we are looking at the shortest of their Armor series - namely the A30. 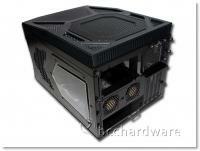 This is a "cube" case that is built for ITX and mATX motherboards. Just because the case is small doesn't mean it is short on features. 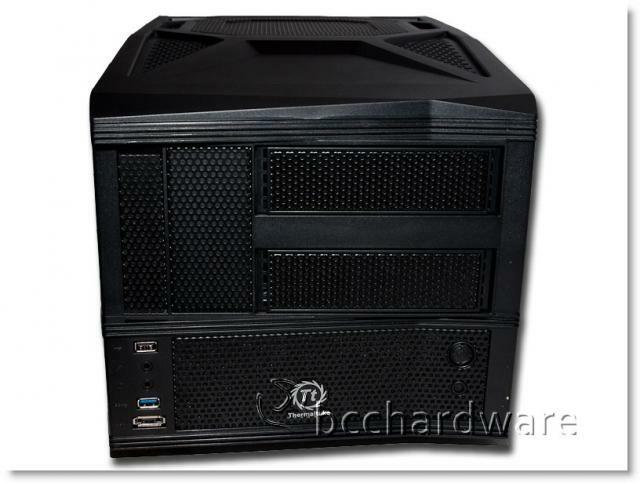 In fact, this case packs a removable motherboard tray, support for a total of four Hard Drives, room for very large graphics cards as well as a pair of 5.25" devices. When you combine that with standard front Audio and USB 3.0 ports, you've got the makings of a pretty sweet rig - and all in a little box that is very portable. 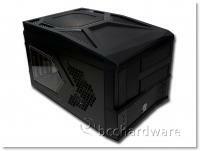 The Thermaltake Armor A30 is a short steel chassis with touches of plastic on the top and front and it is pretty stout. 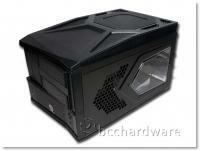 It comes with a very large 23cm fan on top for exhaust as well as a pair of 60mm fans that also act as exhaust fans. 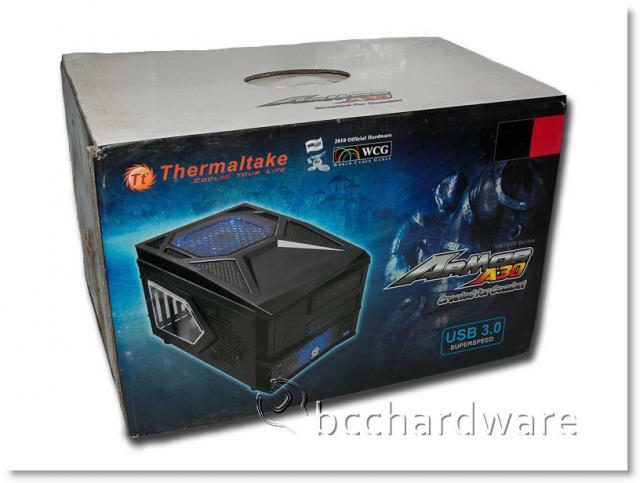 Fresh air is introduced to the system through a single 90mm front fan that acts to cool the drives and pushes air over the entire motherboard. The styling on the left side is pretty nice with a partial window that shows just enough of the goodness inside to keep people interested. The right side is pretty much identical and this allows a nice view into the system - so make sure your cable management is good! There are also a few "honeycomb" areas that will naturally draw in air as there is more exhaust than intake - giving the overall cooling system negative pressure. 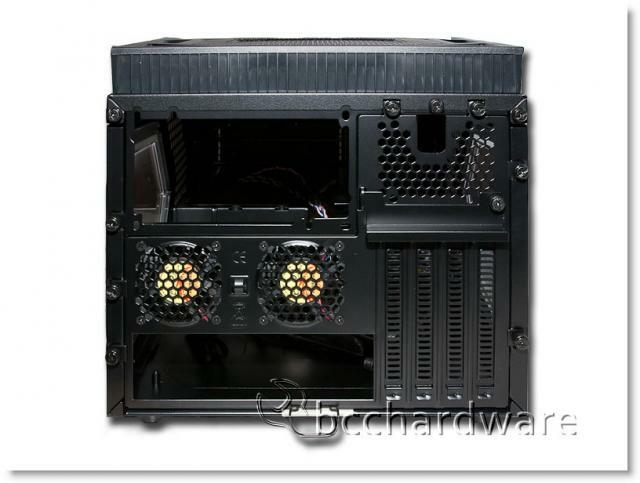 This is alright, but with more exhaust fans than intake fans, the case will pull in air through these areas and introduce dust into your system that would otherwise be caught in the intake filters. The overall appearance of the A30 case is pretty clean and tidy. The front is pretty basic and has a "mesh" look that seems to work for many people. You can see the appearance of both 5.25" bays as well as a single external 3.5" bay. The rear of the case is a little more interesting as it has a pair of 60mm fans, and removable PCI slot covers that can easily be replaced. As the motherboard sits flat on the bottom of the case - the PSU has to be mounted above it - and this can cause issues for larger coolers as well as room to work inside the case. 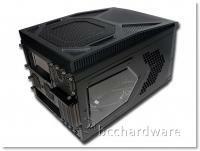 This isn't a roomy case to begin with and when using standard PSU, it will get a little crowded later on. In order to get USB 3.0 to the front, there is a USB 3.0 pass-through cable that's I'm not all crazy about. You can see that Thermaltake has left a whole above the PCI slots that you can feed this cable through. Other front I/O is taken care of internally. On the next page we'll take a look at the features and specifications of the Armor A30 MATX case before we take a closer look and do a system build to see how it all works out.